With over 15 years industry experience, we are a passionate graphic design agency based in the heart of Devon. 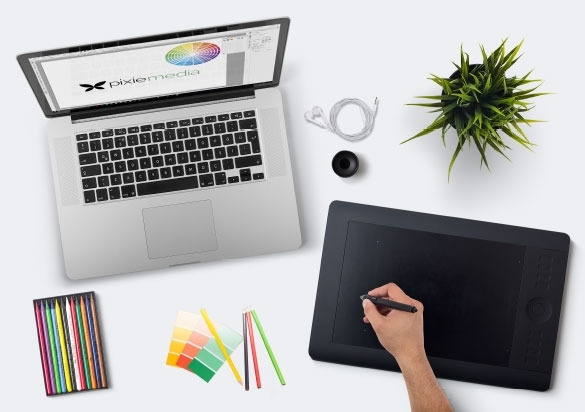 Working within a wide variety of sectors we produce creative and engaging brand strategies, identities, brochures, print, website designs and ways to communicate that enable our clients to stand out and connect with their audience. Put simply, our design adds personality, brand growth and delivers results. We are a graphic design team creating everything and anything from brochures, logo design, digital & display advertising, design for all types of print, exhibition stands and branded stationery & gifts. Together with heaps of experience in all areas of print and graphic design we not only offer design solutions but production solutions too. We take care of your order from design concept to delivery. If you are looking for anything from business cards to billboard posters, get in touch and discover the extra benefit working with Pixie Media can offer your business.